KuCoin exchange, one of the biggest trading platform in Asia with great features is remarkably proud to announce the listing of another potentially fast-growing token. As of today, the Distributed Credit Chain is added on the platform. 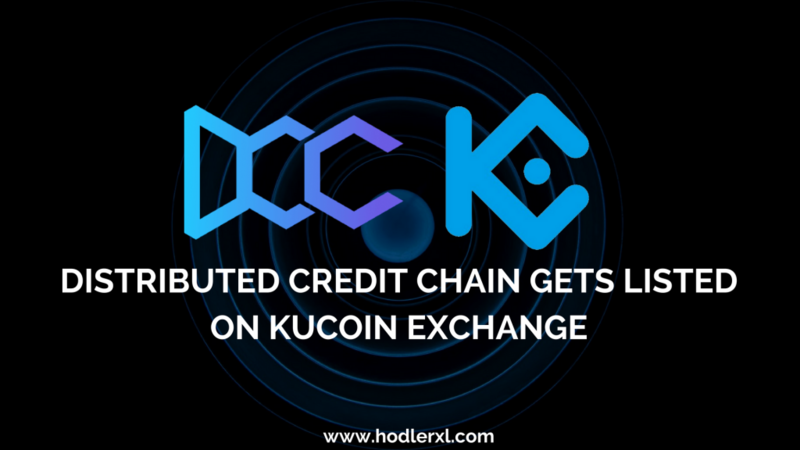 DCC holders can deposit and sell their assets on KuCoin. DCC is now available for deposits with supported pairs including DCC/BTC and DCC/ETH. Buying will start at 21:30 (UTC+8) while Selling and withdrawal will commence at 22:00 (UTC+8). The usual system for finances is seriously centralized. The monetary transaction depends immensely on assistance and commendation from big finance organizations which offers large transaction charges. Financial monopolist associations have increased loaning fees for debtors and lowered the interest earnings for creditors. It serves as the payment for works in Distributed Credit Chain. Each job in DCC requires DCC settlements. DCC token contracts manage the balances to uphold a fixed overall DCC amount. The handling of DCC payments is primarily dependent on payment contracts, which are in control of settlement guidelines for multiple payers’ partaking. DCC made a lot of tactical partnership with DATA, Juzix, Deepfin, Usechain, MLG Blockchain and Newton Foundation Ltd. The Distributed Credit Chain ICO happened on May 28 and May 29. During this token sale, DCC ICO price was set at USD 0.0388 each which is equivalent to (0.00007299 ETH). They have raised a total of 26,400,000 USD funds. DCC is now trying to end the monopoly practices of some old financial institutions completely. Distributed banking utilizing decentralized thinking can revolutionize the usual cooperation model. It can entirely change the structure, debt, and assets of businesses. Institutions regarding bid data analysis can help regulate the whole industry. 2017- It was able to build a combined identity network centered on Ethereum test system. The DCC testnet was also released during this year. 2018- It opened a self-made API on DCC. It plans to create DCC MPC and enter the lending market in Indonesia. 2019- Distributed Credit Chain targets to come inside the loaning industry of SEA countries including Vietnam and aims to expand here. 2020- The Distributed Credit Chain’s public chain migration is likely to release this year. Stewie Zhu, the creator of DCC, is a respectable entrepreneur. Stone Shi is the co-chief researcher. Another member of the team is Dr. Daniel Lu. He earned his doctoral degree in Mathematics at Yale University. Along with them is the group of five brilliant advisors that persistently work for DCC. They are Yu Chen, Ming Yao, Zhiwu Chen, Henry Cao and last but not the least Matthew Chang.